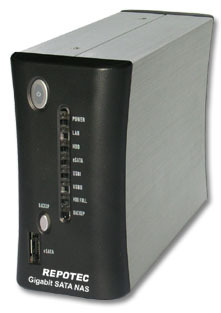 Easily back-up your data and share them, this Gigabit SATA NAS with USB is a high-speed, economical, powerful NAS (Network Attached Storage), using the efficient SATA interface and providing an excellent data storage and sharing solution for your small business, SOHO (Small Office or Home Office) or personal requirement. You may also back-up those files from your USB storage devices with pressing the “Backup” button. Embedding FTP server and Web Server. The FTP server allows users to backup and share files with FTP client. The Web server provides an easy way to share files by web site. It also equips 2* USB ports for your USB storage devices and USB printer. With connection to USB storage, the device shares your files in a more flexible way. The set-up procedures and operation are simple and user-friendly. The embedded Linux device works highly stable and is affordable for continuous operation.